Do you want to capitalize on the growth potential, anonymity and freedom that digital currencies offer — on a tax-deferred basis? If so, a Digital IRA could be an excellent option for you. One of the best ways to reap the benefits that digital currencies can offer is to hold them in a Bitcoin IRA. This unique, self-directed individual retirement account (IRA) permits special types of assets that most conventional retirement funds cannot include. Although Bitcoin IRAs can serve all the functions of conventional retirement accounts, there are key differences that set them apart. Self-Directed IRA Accounts: You Choose It. You Buy It. You Manage It. Most people don’t know about self-directed IRAs, so the concept of using them in retirement accounts might be unfamiliar. Using a Bitcoin IRA does not limit investment choices to digital assets. The self-directed structure of this account gives investors the same asset options as conventional retirement accounts (such as stocks or mutual funds) and the freedom to invest in alternative assets such as digital currencies. Unlike investments in conventional retirement accounts that are overseen by brokerages and financiers, you maintain complete control over the investment vehicles in which your retirement savings are stored. As a self-directed investor, you accept responsibility for the investment choices in your account. You engage in the cryptocurrency market by working with BitIRA to buy individual cryptocurrency assets. In other words, you choose, invest in and manage each asset in your account. Although you are in charge, when you purchase digital currencies for your IRA, you work with respected partners in BitIRA and Preferred Trust Company (PTC), a certified, self-directed IRA custodian. By opening an account with PTC, you can rest assured knowing that they will provide all of the administrative services for your account, including making any required financial disclosures. In 2014, the IRS ruled that digital currencies should be treated as personal property for tax purposes. This makes digital currencies eligible for Digital IRA accounts. In addition, by assuming full responsibility for your investment choices, the IRS grants you legal authority to invest in a broad range of alternative assets that goes well beyond digital currencies. The type of IRA you want. A Bitcoin IRA can be set up with any of the classifications that you are used to, such as Traditional, SEP, SIMPLE and Roth IRA accounts. Cryptocurrency assets. These include: Bitcoin, Bitcoin Cash, Ethereum, Ethereum Classic, Litecoin, Ripple, Zcash, and Stellar Lumens. Conventional IRA assets such as individual stocks and mutual funds. A wide variety of other alternative assets such as precious metals, tax liens, and real estate in commercial, residential, or raw land. You can add these conventional and alternative assets to a single IRA. With BitIRA, you gain access to an easy way to start and maintain a self-directed retirement account that includes individual digital assets. Explaining your investment asset options. Assisting with contributions and distributions. Some of these accounts have eligibility requirements before they can be transferred to a Digital IRA. Contact a BitIRA Digital Currency Specialist to determine if your current account qualifies for a rollover. With BitIRA, you can also exchange one form of cryptocurrency into another and take cash or in-kind distributions. We’ve made securing our customers’ investments our #1 priority. All cryptocurrency investors must use a digital wallet. Unfortunately, many of these wallets are “hot” (connected to the Internet), which exposes investor credentials to potential hackers. Putting the credentials for each customer on a personal hardware device, disconnected from the Internet. Storing the device in a vault, protected by armed guards 24/7. Fully insuring assets against hacking, fraud, theft or mistakes. See how BitIRA compares to the competition. 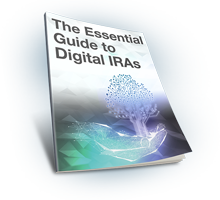 Our Digital IRA service is a full-service solution, designed to make your long-term investment secure. Speak directly with a Digital Currency Specialist to get an in-depth explanation of the investment process. Or, ask any questions you may have and discover the opportunities currently available. Learn how you can start receiving the benefits of a Digital IRA. Contact BitIRA at (800) 299-1567 today. Hard cap. Just as professional sports leagues have salary caps, many cryptocurrencies have a cap or limit on coin supply. This hard cap — a limit of 21 million for Bitcoin, as an example — is the maximum supply, which cannot be changed. This limit plays a large part in a cryptocurrency value. Still have questions about cryptocurrencies and Digital IRAs? We have answers here.